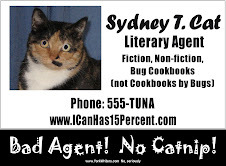 I'm sad to report that Sydney, the real-life cat who has "played" the fictional Bad Agent Sydney these past few years, and who is the inspiration for her diva personality, is quite ill. She started sneezing and coughing a few days ago. It seemed to get better yesterday, then went the other way last night. She was quite warm and lethargic, and lost interest in her beloved Greenie treats, which scared me more than anything. We got her into the vet this morning as early as possible, and after $400 or so worth of tests (some of which we are admittedly waiting for results on), we still don't know what is wrong. The X-Rays show that her lungs are congested, and she was running a temperature of 106 (101 is normal). It could be a whole shopping list of things, from treatable, to maintainable to fatal. We just don't know. They gave her injections of antibiotics and a fast-acting steroids and she is home now. We're watching her closely, making her comfortable, and hoping for improvement (and that maybe the test results will tell us more). Few things worse than having a sick furry child. All my best you way. Oh no! Get well soon, Sydney! And wishing you the best, Steve (and Chris)! Please hug Sydney for me. And if that thought distresses her, tell her that I am not doing the hugging myself. It's so hard when our furry family members get ill. I'm thinking of her. Sydney seems somewhat better - the meds kicked in and she is at least eating a little - though she's still very raspy this morning. Not well, not by a long shot, but certainly better. 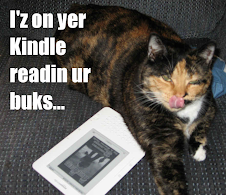 Now we have the unenviable job of trying to get the World's Worst Literary Agent to take her pills.